Issues of a former publication of the South Dakota State Historical Society titled “The Wi-Iyohi” (Wee-ee-yo-hee) were recently added online to the South Dakota Digital Archives. “The Wi-Iyohi” was a monthly bulletin published by the State Historical Society from April 1947 to November 1970. The first issue ran only four pages long. In its last year, “The Wi-Iyohi” grew to an average of 16 pages each month. You can access the collection by going to the State Archives website at history.sd.gov/archives and finding the link to “Wi-Iyohi” under “In the News” or by making a search engine query for South Dakota Digital Archives. "Wi-iyohi," meaning "each moon," was submitted as the name for the publication in 1947 by Louisa Riggs, the wife of Dr. Theodore Riggs (grandson of the famous missionary Stephen Riggs) and H.S. Morris of Sisseton, a cousin of Theodore Riggs. The first editor, Will Robinson, former secretary of the State Historical Society, supplied many articles on the history of the state, many of which were the result of questions submitted by members, amateur and professional historians, and students. “The Wi-iyohi" was a tool for the dissemination of little known facts about South Dakota and its pioneers. 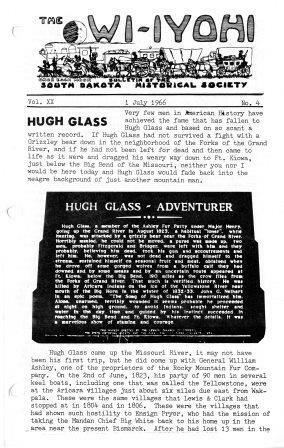 Within each bulletin are maps, photos and general histories of South Dakota. Historical information in “The Wi-Iyohi” is still referenced today. The bulletins also provide institutional information for the State Historical Society. In total, there are 281 issues of the bulletin available online. The scanning project comprised just over 2,600 individual scans and roughly 2,400 megabytes of data. Conner Ulmen, a 2017 senior at Pierre Riggs High School, scanned the issues as part of the Project Skills program, a statewide, paid work experience program for high school students with disabilities in South Dakota. The program is a cooperative arrangement between the state vocational rehabilitation agencies and local school districts. The South Dakota Digital Archives, an online resource launched in January 2012 by the South Dakota State Historical Society-Archives, provides researchers digital access to unique historical records. There are over 70,000 items in the digital archives, including photographs, manuscripts, land survey records and finding aids to government collections.